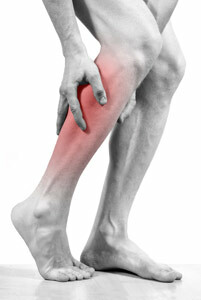 Cramps are the involuntary tightening of a muscle that won't relax, occurring most often in the calf and thighs. The cause of muscle cramps is not exactly known, but is thought to be caused by many things such as overuse, injury, staying in one place to long, strain and of course from being dehydrated. Those in hotter climates or in just plain in warmer weather are more likely to get cramps during activity, as there is more fluid loss. Fluid comes into play here because fluid helps muscles contract and relax and also keep muscle cells hydrated. If there is an inadequate water supply, muscles will not work as good as they should, causing strain-- and then the cramps. Also, those with muscle cramps may want to take a banana with their water. Potassium loss, often due to taking diuretics, can also cause muscle cramps. Potassium is also important for muscle contraction. A small amount of potassium is lost through your sweat, and a larger portion is lost through muscle activity. The diuretics, which also can cause dehydration, rob the body of this much-needed element. Calcium and magnesium also play a role in keep muscles in good shape. It is recommended that during work-outs, people drink water or sports drinks (to replace those electrolytes) at set intervals and also to not gauge the need for water by the thirst mechanism. Children especially are known to be less hydrated when doing something physical, and therefore may cramp easier. Encourage you child, even if they just are active in school gym class, to drink water during the activity. How can leg cramps be prevented? Stretch before and after exercising, along with warm-up and cool-down exercises to prevent cramps from extensive exercising. Hydrate before, during, and after the activity especially if it is over an hour. Wear good shoes, flat feet and other structural problems make some people susceptible to leg cramps. Keep blankets loose at the foot of the bed to prevent your toes from pointing downward while you sleep. It is important to replace your potassium stores on days when you get at least 45 minutes of rigorous exercise. Potassium can be found in a variety of food sources such as chicken, fish, carrots, bananas, prunes, milk, cooked greens and sweet potatoes. How can I make cramps go away? Stretch and massage the muscle that is cramping. Ice is both a pain reliever and an anti-inflammatory. Try massaging the area with ice for no more than 10 minutes. Take a warm shower to relax the muscle, or place a heating pad over the muscle. Heat improves superficial blood circulation and makes muscles more flexible, so some people find heat more soothing for muscle cramps than ice. Walk around and jiggle your affected leg and elevate it. Try standing on the balls of your feet (tip-toes) and seeing if this helps. Massage the calf, arch, and toes with baby oil for 5 minutes, using a back and forth motion across the length of the muscle. Rolling over the affected area from side to side with the palm of your hands can also help. Almost everyone experiences a muscle cramp at one point in their life. There are a variety of muscle cramps and causes of muscle cramps. It is said that numerous medicines can cause muscle cramps. This makes it important to remember several remedies that can help you deal with your muscle cramp. Most cramps can be stopped if they can be stretched so try that first! While drinking water during a cramp spasm will not help the cramp instantly fade away, staying hydrated regularly and especially during and after a work-out will keep those "Charlie Horses" and other cramps riding off into the sunset!